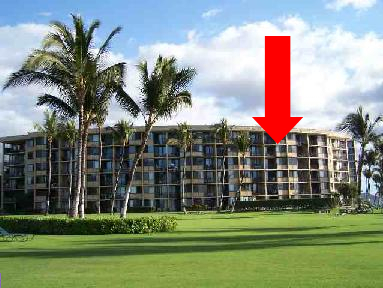 This fifth floor condo at the Kihei Surfside Resort is on the sought after ocean side of the elevator. It has a spectacular view from the kitchen, living room, dining area and lanai. It has been progressively remodeled, most recently a new master bath in 2010. Overall, the unit is in excellent condition and is very popular with guests. Our guests gave this unit a high rating in 2009 – 4.9 out of 5 for the view and 4.27 overall out of a possible 5 on our Guest Satisfaction Survey Index, placing it in our “Deluxe” Category. The lower scores in the survey were primarily regarding the shower and bathroom. As a result of the new master bath, as well as new bedroom window treatments, new pillow top king bed, and new 47” wall mounted LCD TV, all done during 2010, we have upgraded the unit to our “Luxury” category. The peninsula style kitchen has ceramic tile flooring, with light maple cabinets and laminate counters with maple wood trim. The kitchen is well equipped with stainless steel appliances - a side by side refrigerator with ice maker and water dispenser, flat top stove with microwave hood fan above, full size dishwasher and garbage disposer. There is a hookup on the peninsula for free high speed internet and a telephone with free long distance calling to the United States and Canada. The living room is carpeted, and has a queen size sofa-bed with a matching loveseat and a swivel-rocker bucket chair. There is also a new 47”, wall mounted flat screen LCD TV, stereo with CD player and IPOD dock, and multi speed ceiling fan. 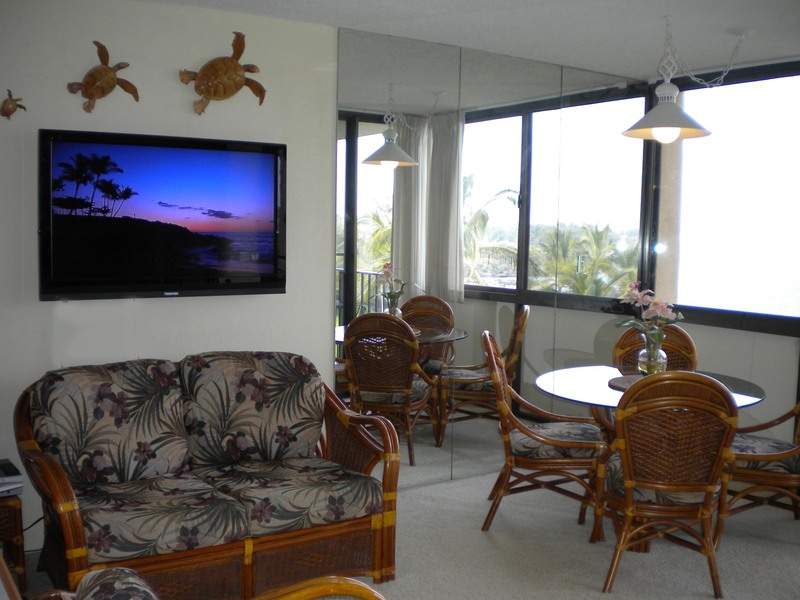 The dining area has a round rattan glass table with 4 matching tropical rattan chairs. The large, private lanai has a bistro table with two padded chairs – a perfect place to enjoy your morning coffee or a romantic oceanfront dinner! Turtles and dolphins can be seen year round, whales in season. The entry hall is tiled, with a large dresser. The bedroom is carpeted with a new pillow top king size bed, multi speed ceiling fan, plantation shutters, digital security safe and Hawaiian style rattan furniture. The master bathroom has a full size, walk in shower with a small bench and a Pulse shower spa system, including rain head, hand held wand/massager and six body sprays. There is an over height vanity with granite countertop. The half bath has a Hawaiiana theme. Both bathrooms have Kohler toilets. The unit is fully equipped with, fresh linen and towels, iron/ironing board, hairdryer, beach chairs, beach towels and a cooler. Umbrellas, boogie boards and snorkel gear are not supplied, but are often left behind in the units by other guests - no guarantees. 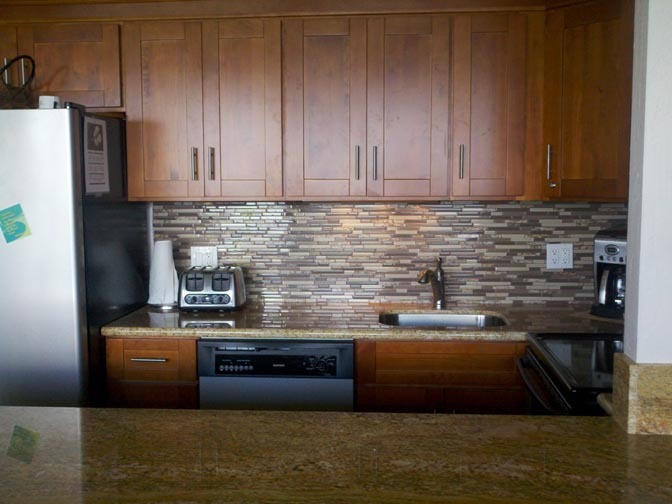 This unit is an excellent choice for guests who are looking for a spacious, comfortable high end oceanfront condo with a spectacular view. 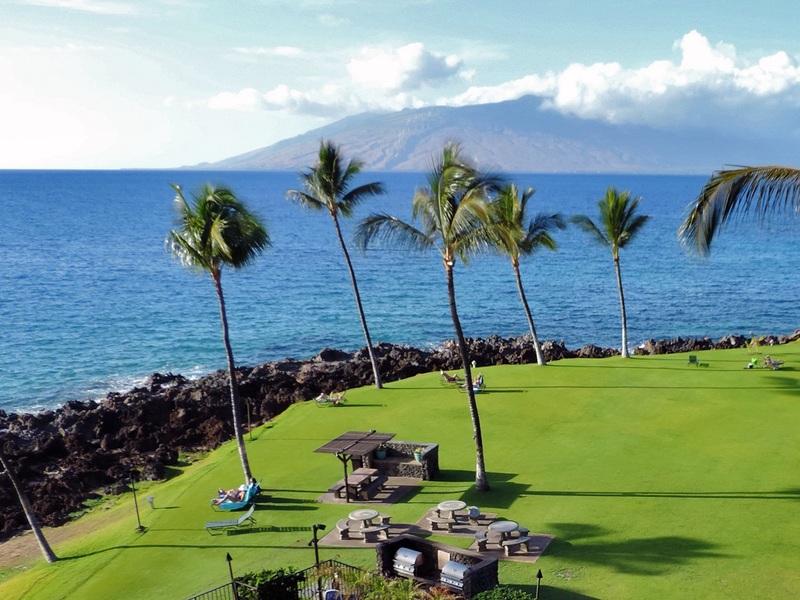 It is customary for the residents of the Kihei Surfside to gather each evening for cocktails on the shore near the tiki torches for a traditional Hawaiian sundown ceremony. This is a great opportunity to meet your neighbors and fellow vacationers!